Shopping with a toddler can feel like a marathon event as you find yourself scrambling to entertain and keep up with an endlessly curious kid. But this time, the two of you are embarking on a mission to find the potty training gear that's just right for her. Ready to hit the store? Here’s a shopping list to help guide your potty related shopping adventure. Pull-Ups® Learning Designs® Training Pants feature unique patterns that fade when the training pant gets wet—a highly visual way that helps your daughter see the difference between wet and dry. She’ll appreciate the eye-catching Disney designs featuring Doc McStuffins. Pull-Ups® Cool & Learn® Training Pants provide a brief cooling sensation when wet—a powerful way to help teach your daughter the signs of when they need to go. These training pants also spotlight a much loved Disney character, Sofia the First. 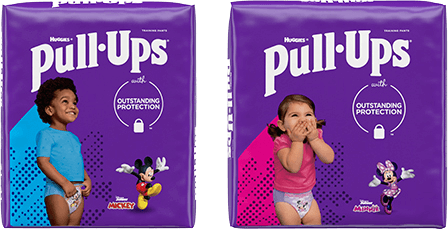 Pull-Ups® Night*Time Training Pants have extra absorbency so you and your daughter can stay consistent during potty training – even at night. Add to that the fact that this particular training pant features the classic Disney character Cinderella and you know it will be a hit with your daughter. Stand-alone potty or toilet insert: Some kids find it comforting and reassuring to sit on a tot-sized potty. Others prefer to use a potty insert on the big toilet right away. This is simply a matter of personal preference—what feels right to your daughter—so let her take the lead here. Big Kid* Flushable Wipes: Help your daughter understand the importance of staying clean after a trip to the potty. Flushable wipes help your child feel cleaner than with toilet paper alone. Plus, they’re septic safe, and break up after flushing. Foamy soap dispenser: Your daughter will look forward to washing her hands if hand washing feels like fun. So you’ll want to encourage her to pick out a foamy soap dispenser that serves up bubbles in her favorite color and/or scent. Disinfectant wipes: Accidents are inevitable on the road to potty training success. Make cleanups quick and easy by stocking up your favorite disinfectant wipes, not to be confused with flushable wipes. Just make sure that you store them in a safe place. The frills: Finally, round out your purchases with a treat or two in honor of the occasion. Pick up a potty training how-to book for you and a bathroom-only toy for her to store in her potty training treasure chest and keep her entertained while she’s sitting on the potty, waiting for the magic to happen. When you're ready: Give your daughter a chance to pick out a few pairs of underwear with the styles and colors that appeal to her. She can either scoop them up now and set them aside for when she's ready to start wearing them or the two of you can plan to pick them up on a future shopping trip. Looking for some additional guidance as you embark on this training journey with your daughter? Read about the Pull-Ups® Potty Partnership— a system that brings your child into the process as a true partner, tailored to her unique personality and how she learns.